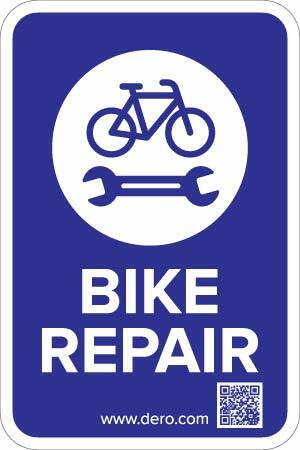 Make your bike repair amenities easier to find with directional signage. Made of lightweight, but durable aluminum with standard hole placement for easy installation. QR code takes users to a map of known Fixit repair stand installations in the area. Made from heavy-duty, 63 mil thick aluminum. Unlike steel signs, our aluminum signs do not rust. Signs are printed with 3M screen printing or 3M outdoor digital inks designed specifically for outdoor traffic and parking signs – for the ultimate in durability. Lasts years outside. Rounded, burr-free corners, for longer life and a professional appearance. Thick 63 mil signs do not bend. They have been proven to outlast the toughest of storms.